Not all commercial locksmiths are created equal, so we’ve decided to prepare you before you call a commercial locksmith by providing you with eight questions to ask them. Locksmiths can be expensive, especially commercial locksmiths, so it’s important to understand what they do, how they bill you, if the potential locksmith is qualified to assess your situation or not, and provide you with the best service possible. It’s important to know if the company you’re hiring is performing background checks on their locksmiths. Your business has tons of valuable physical and non-physical assets; you wouldn’t want a convicted felon staking out the place and have a key to your front door. Think about protecting your employees as well, this technician can have a history of theft or violence. Is the locksmith who’s providing the commercial service going to charge you for the assessment of your situation, is the assessment free of charge, or will it be free only if you move forward with the service? A lot of times locksmiths won’t mention that they are charging you for the assessment, but will bill you for it. You need to ask this question prior to them coming to your location. Many locksmiths work alone, which is fine, but if they try to appear to be bigger than they are that could be a red flag. If your situation requires a significant amount of work, it’s best to work with a commercial locksmith company that has multiple techs capable of getting the job done properly and within a certain timeframe. If you like working with the same locksmith technician each time, it’s better to go with a one-man business then. They will be the ones helping you, billing you and you can build a trust with them. Larger companies usually send out any available locksmith they have at that time, whether it’s in the middle of a job or not. It’s essential for locksmiths to keep up-to-date with the latest trends in electronic technologies, keyless entries and security systems. This is important because there is a reason why there are advances in the first place, it’s because the security and product are better. You wouldn’t want an outdated system the day it’s installed; think how easy it is with the internet today to find out how to bypass older systems. This is a serious question for your commercial locksmith. Make sure the locksmith you’re hiring to fulfill your objective doesn’t do just a few services here and there. 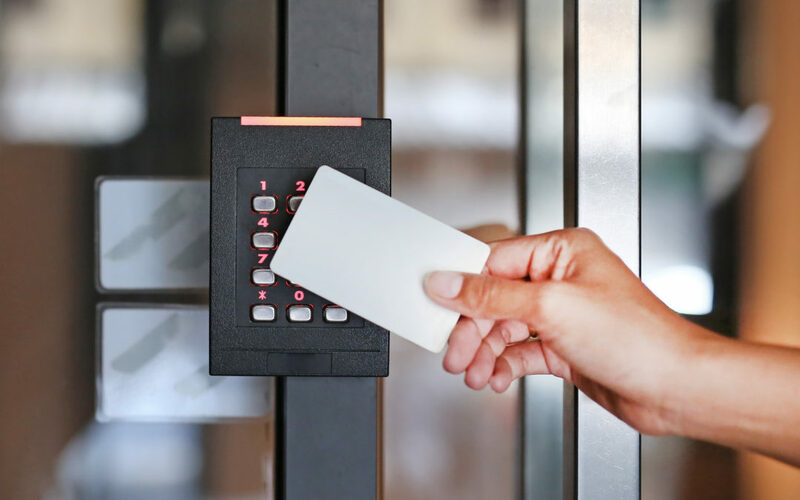 They need to be able to handle the entire access control system from every aspect and do it well with the proper tools. Otherwise, you’ll be hiring other companies to fix the problems that appear a little down the road. This will increase your cost exponentially, put your business & employees in a vulnerable position, and raise your risk of a fire. Commercial locksmiths and the projects they work on can be expensive, so it is important to ask for referrals or testimonials from other clients who have had similar problems. Even checking out their online reviews from sites like Google Reviews, Facebook and Yelp can help you gauge if the company will do a good job or not. In order to know if your commercial locksmith is really qualified and not some fly by night scammer, you should ask if he or she is licensed in your state and properly insured. Make sure they show proof of both of these, don’t just take their word of it. Once you get their license number, enter it here at the Illinois Department of Financial and Professional Regulation to make sure they are and double check that it hasn’t expired. Know that the state of Illinois requires locksmiths to carry a $1,000,000 liability insurance policy also. This is for your protection in case something goes wrong. Knowing the brands of the products being used are very important because you want to make sure these brands are of the highest quality and trusted. Plus, you want to make sure if they are billing you for the top of the line, you actually get top of the line. As stated above, commercial locksmith services can be very expensive plus your business and employees count on you to do a little due diligence. So, don’t waste your time dealing with mediocre locksmiths who aren’t licensed or properly insured. You’ll end up not only wasting time and money but also opening your business up to severe risks. Make sure you ask your commercial locksmith all eight of these questions and demand answers BEFORE you let them in. DON’T be afraid to hang up the phone and call another locksmith if red flags start popping up. Plus, make sure you get these answers BEFORE they come to your business. At Hawken Locksmith Services, we are trained, local, trusted and licensed (#191000873) professionals with decades of experience in the commercial locksmith industry. We pride ourselves in being prompt, speedy and delivering our clients with the best customer service during their time of need. Feel free to call us 24/7 at 815-762-4464 or 847-989-4804. We look forward to working with you and making you our next successful testimonial!